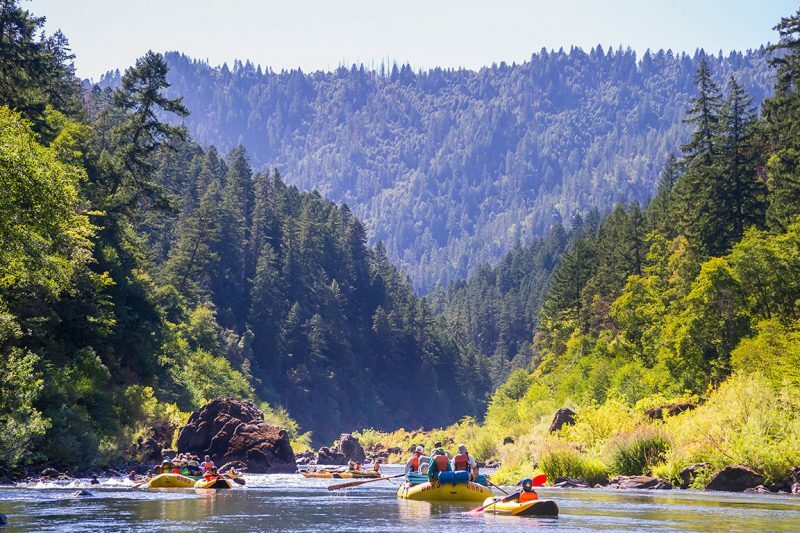 We’ve compiled 40 of the best rafting trips in the U.S. Use the following recommendations as a checklist, perhaps a bucket list, of river destinations that tell the story of a beautiful country. 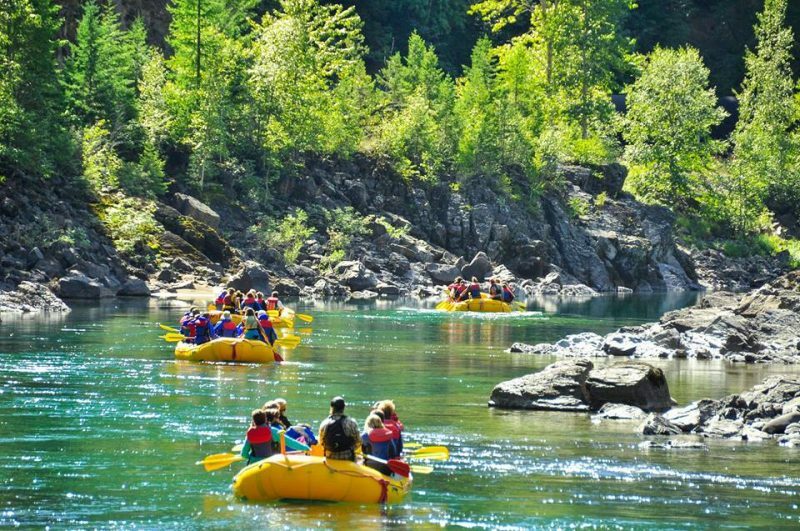 From deep wilderness multi-day trips and family-friendly floats to urban whitewater park adventures, each state’s character shines through in its rivers. 40 Bucket List Rafting Trips in the U.S. The longest urban whitewater rafting trip in the world can be found on a 2.5 mile stretch of the Chattahoochee River that runs between Phenix City, Alabama and Columbus, Georgia. The Chattahoochee Whitewater Park was created when city planners decided to makeover the Chattahoochee and transform the industrial urban waterway into a recreation outpost. River engineers created finely-tuned rapids within the river that range from Class III-IV+ depending on water flow which is controllable and can reach 13,000 cfs at its peak. 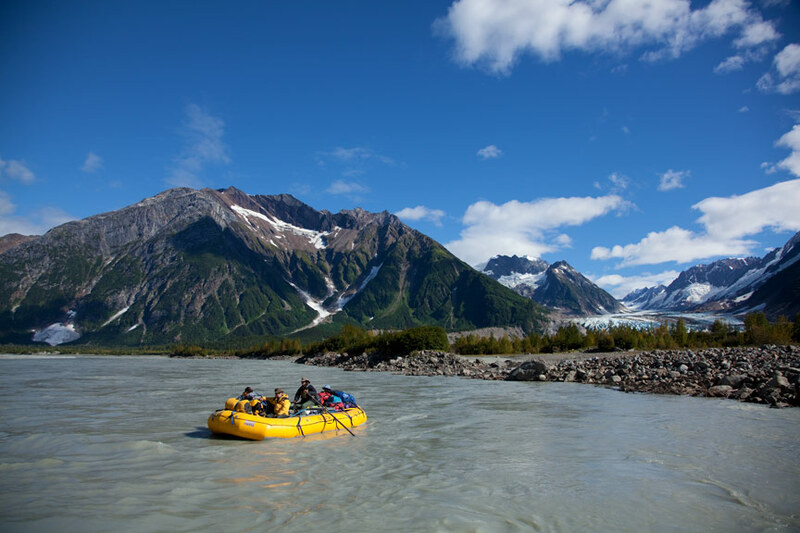 Perhaps the most rugged, remote and raw rafting experience in any state, a multi-day trip on Alaska’s Tatshenshini provides a classic Alaskan wilderness experience. From glacial moraines and floating icebergs to grizzly sightings and float plane shuttles, a rafting trip on the “Tat” is unparalleled. Be prepared to enter “Scenic Overdose Syndrome” on this trip. If a 2-week rafting trip through the Grand Canyon hasn’t made it to the top of your list, go ahead and move it to number one. The experience of descending through layers upon layers of ancient rock as big, fun whitewater rapids transport you to your next dream campsite just can’t be missed for any rafting enthusiast. 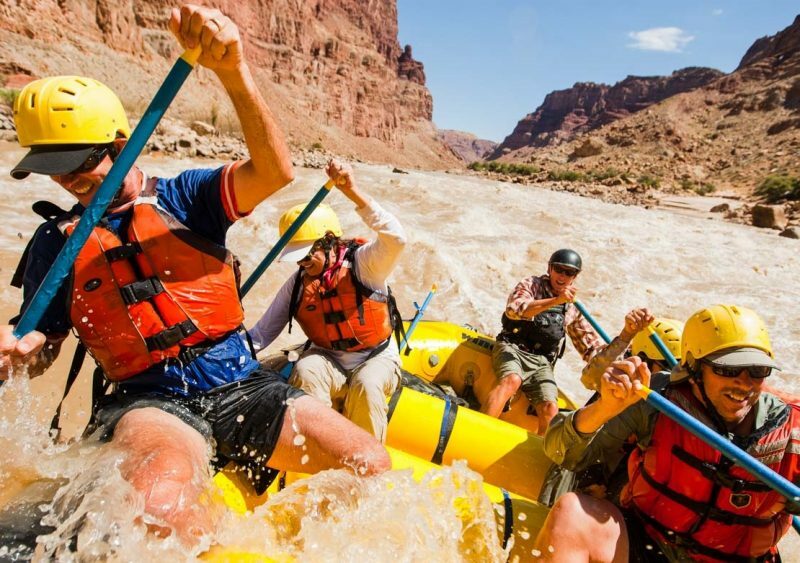 Add in the side hike opportunities and no other form of recreation offers a more intimate and comprehensive experience in the Grand Canyon than floating the river. Get the kids out for a family-friendly float on the Mulberry River in Arkansas’ Ozark region. Gentle rapids mean you can navigate your own raft without a guide for a great bonding experience and personalized day on the river. The river offers a tour of quintessential Ozark scenery: narrow canyons, dense woods and tree-lined bluffs. Arkansas designated the Mulberry as a State Scenic River, which led it to be included in the Federal Wild and Scenic Rivers system protecting this rafting recreation resource for generations to come. Colorado’s Rocky Mountains produce countless whitewater rafting trips that would take years to tick off your list. However, the Yampa has a special characteristic that other rivers in the state can’t offer. 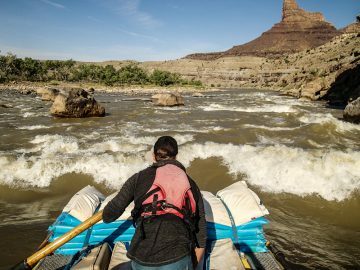 “While most rivers in the Colorado Basin have been dammed and diverted, the Yampa runs free,” says American Rivers’ Amy Kober. Exciting Class III rapids, vivid canyon colors and stories of outlaw hideouts make a trip on the Yampa River one of the best multi-day rafting excursions in the country. “It’s a special thing to be able to float a truly wild river,” says Kober. Connecticut’s original name “Quinnehtuckqut,” or land of the winding tidal rivers, is a paradise for canoers and kayakers. And while whitewater is a bit hard to come by, in northwestern Connecticut there can be a very short, but excellent, springtime rafting season on the Housatonic where paddlers can find a 2-mile, Class IV stretch of challenging whitewater. Mostly, however, paddlers opt for the more reliable 10-mile stretch of scenic, do-it-yourself rafting near the picturesque New England town of West Cornwall. While Florida may not have mountain ranges and the accompanying whitewater, the state does have incredible scenery with the occasional spicy interlude of whitewater. Take the Suwanee River through Big Shoals State Park, which features the biggest rapids in the entire state. Most river users opt for lazy floats and picnics on riverside sandy beaches through the state park and a portage around Big Shoals rapid. However, the Class II-III rapid could also be the highlight of your day if you seek a whitewater punch for your day of Florida rafting. At the southern end of the Appalachian Mountains, Georgia has great river running options. However, a trip to the southeast must include a descent of the legendary Chattooga River, flowing along the border of Georgia and South Carolina. 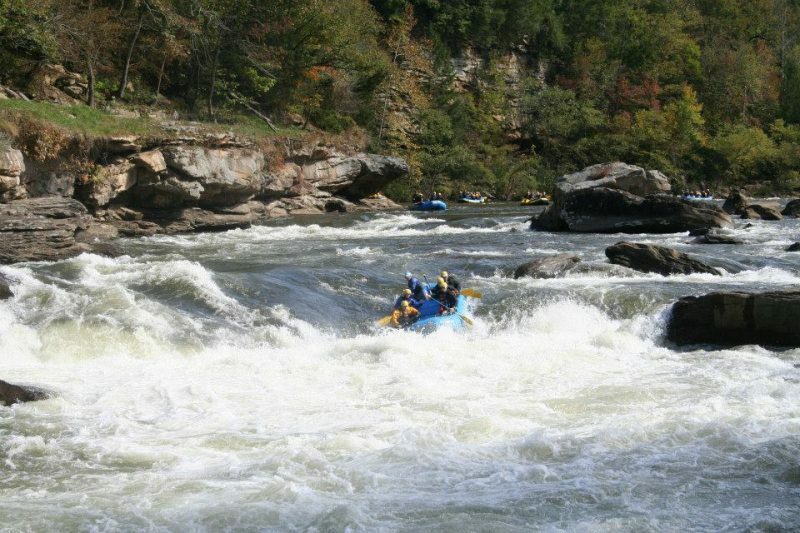 Whitewater rafting through the boulder gardens, rock slides and waterfalls of the Chattooga forged Olympic paddlers and incited the popularity of rafting over the past 40 decades. Section 4 of the river includes rapids such as Bull Sluice, Woodall Shoals, Five Falls and Sock-em-dog—names known to nearly every whitewater paddler in the nation. Also see: Chattahoochee River (Alabama). 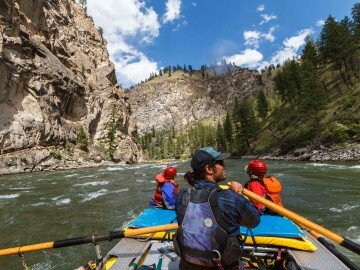 As classic as it gets, the Middle Fork Salmon River rafting trip through Idaho’s Frank Church Wilderness has long held the title for the most spectacular multi-day rafting experience in the country, and certainly in Idaho. 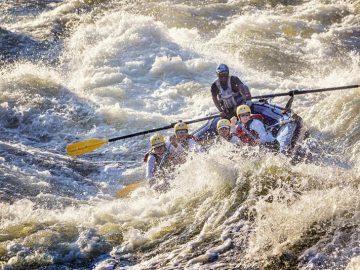 Exhilarating whitewater rapids link together for an incredible adventure through Idaho’s finest mountain landscape. When not enjoying the river’s clear water and paddling thrills, hiking in the surrounding alpine forests or soaking in multiple hot springs will immerse you even more in this storied wilderness. On your next cross-country drive, consider a pit stop to enjoy Illinois’ best rafting on the Vermillion River. 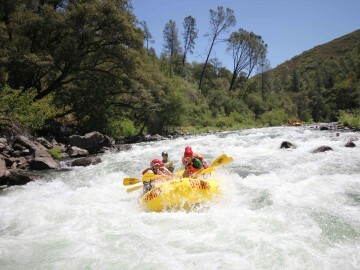 Considered a great beginner trip, local outfitters will rent you a raft to take on the river’s Class I-II rapids. When rains have filled the banks with more water, these rapids can get more rowdy and require experience. Rapids are plentiful, but mostly end in long pools that allow beginners to recuperate if any unexpected action occurs. While named the Whitewater River, this Indiana rafting classic will not necessarily include big waves and surges of adrenaline. 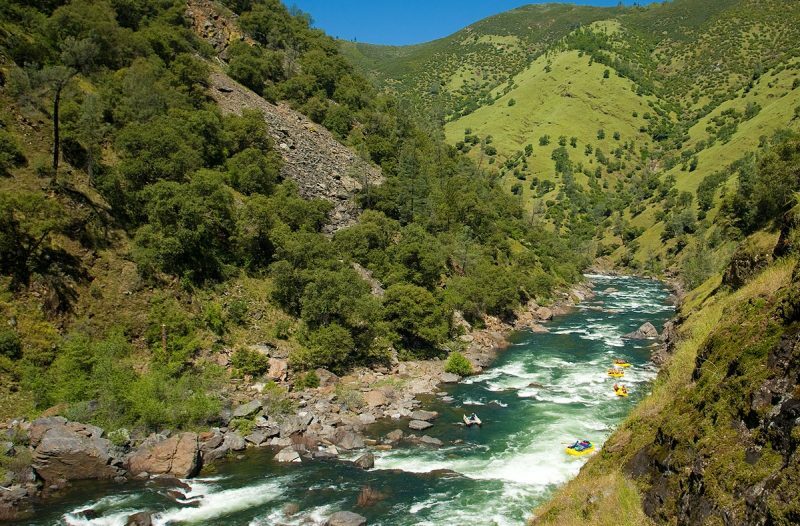 Instead, this river offers a steep gradient with steady swiftwater and scenic forest views. Many river runners opt to captain their own raft, but guided trips provide excellent interpretation of the river’s history and natural features. The reconstructed Cedar River used to be a source of potential deaths if swimmers encountered one of the deadly low-head dams along the river. Today, the dams have been removed and the Charles City Whitewater Park now provides river enjoyment for whitewater boaters and an annual economic impact of more than $700,000 for the town. A win for whitewater. You’ll have to bring your own raft to take on these rapids, but the surf waves are sure to make your efforts worthwhile. 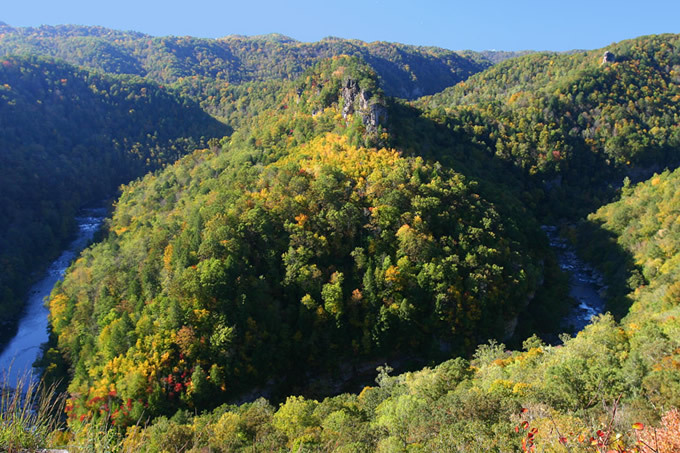 When fall leaves begin to cover Kentucky’s small mountain roads, scheduled dam releases fill the Russell Fork and elite kayakers and rafters flock to the area for the legendary Class IV-V action. Certainly not for beginners, this top Kentucky rafting destination demands highly technical and strong paddling for any raft team looking to descend the four miles of this steep creek. Paddlers often camp out for a weekend and run the river multiple times each day, allowing you to really immerse yourself (ideally not literally) in this Kentucky classic. Flowing south of Mt. Katahdin, the famed final summit of the Appalachian Trail, the Penobscot River is Maine’s top whitewater rafting destination. An upstream dam provides consistent water to create water features such as falls, holes and surf spots in rapids ranging from Class III-V. However, be sure to look up from the whitewater chaos to appreciate Maine’s spectacular scenery and avoid any unwanted Moose encounters. In the far west arm of Maryland the Upper Yough is unequivocally the best rafting destination in the state and the greater Washington DC area. During the release days when water flows out of the upstream dam, you’ll find rafters and kayakers lining up at the put-in to descend this classic eastern steep creek. 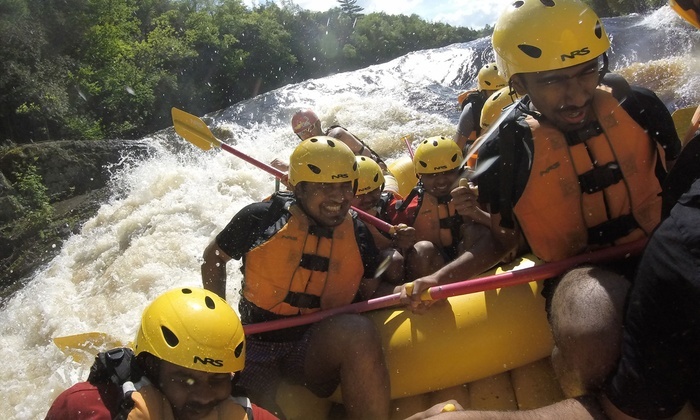 Rafters typically pick smaller crews of 3 to 5 people for their rafts to better navigate the nearly continuous and technical Class IV-V rapids. On busy days, take a lunch break at National Falls and watch boats maneuver from Triple Drop into the falls – hopefully upright! The 3-mile section of the Deerfield River in western Massachusetts called the Dryway has fostered a strong community of Northeast paddlers, and for good reason. The advanced whitewater rapids within this short section are a perfect goal for beginner and intermediate paddlers who are building their skills on other sections of the Deerfield. Rafters can jump on a day trip and experience the northern Berkshire Mountains. The short, but power-packed rapids on the Menominee River have been claimed by many as the best whitewater in Michigan, despite technically flowing on the border with Wisconsin. A deep gorge and large, dramatic rapids make this day trip a unique experience in the Midwest. Some outfitters allow guests to take a look at the final Piers Gorge rapids and opt to portage if it looks too risky for their tastes. In a state known for its 10,000+ lakes, the St. Louis River may seem like an anomaly. Flowing through Northern Minnesota, the river provides Class II-IV whitewater action for rafters and kayakers in a one-day punch. You’ll still experience the North Country landscape rich with wildlife and water, but with a paddle in your hand and a wave hitting you in the face. Draining from the southern edge of Glacier National Park, the Middle Fork Flathead’s pristine water quality, deep forest shorelines and geologic rainbow riverbed hypnotize rafters as they make their way downstream. This premier Wild and Scenic River can be broken into sections for a deep wilderness multi-day trip (plane, horse or foot access only) or a roadside day trip for fishing and rowdy whitewater action. No matter which section you float, keep an eye out for bear tracks, eagles and huckleberry patches. The section of the Lower Colorado River flowing out of Hoover Dam known as the Black Canyon Water Trail may be overshadowed by the upstream Grand Canyon, but is absolutely worth a few days of floating if you’re in the area. It is certainly the best rafting in Nevada. This stretch does not require years of waiting for permits and transports rafters through some incredible scenery. Great for families, this gentle float trip includes lots of side canyon exploring, active hot springs, waterfalls and beautiful geologic formations. A great half-day rafting trip can be found on the Androscoggin River in northern New Hampshire, especially if younger family members or trepidatious first-time rafters are part of your group. Typical river trips lap the Class II-III rapids several times, providing opportunity to take new lines and increase your comfort on the river. Found along the borders of New Jersey, New York and Pennsylvania, the Delaware River attracts visitors from everywhere on the East Coast. Rent a raft or canoe to float, picnic and relax with family and friends for a day, or opt to load up your boat with camping equipment and spend several days on the water. 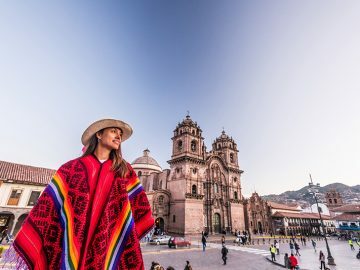 Designated as Wild and Scenic, many sections of this river meander through tall cliffs with distinctive ecological zones and feature buildings that date back to Colonial Times. 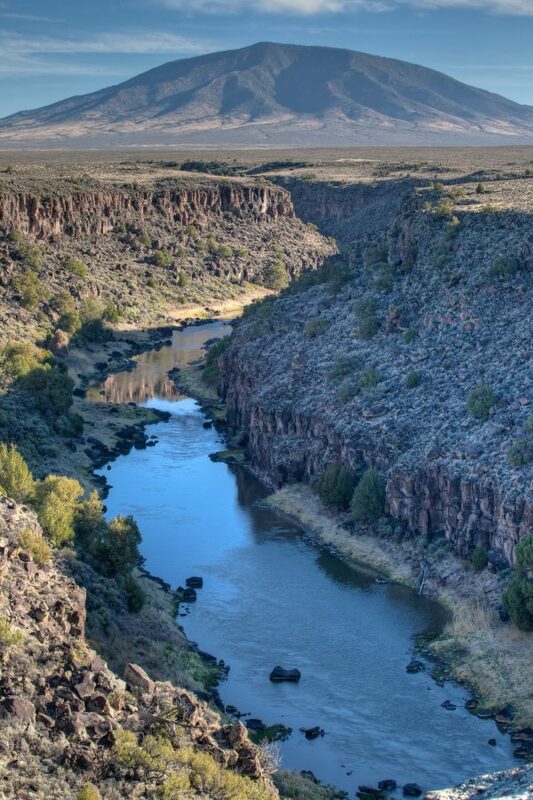 Just outside of Taos, New Mexico, the ground drops away into the 850-foot-deep Rio Grande Gorge. A geologic wonder in a spectacular desert environment, the Rio Grande River flows through this chasm and offers several different sections of rafting depending on your lust for adventure. The Lower Taos Box of the Rio Grande delivers big Class IV rapids in the deepest depths of the canyon while the Racecourse section downstream offers plentiful Class III waves and rapids for an intermediate day. Nearly every Southerner has a story about their trip down the Nantahala River. 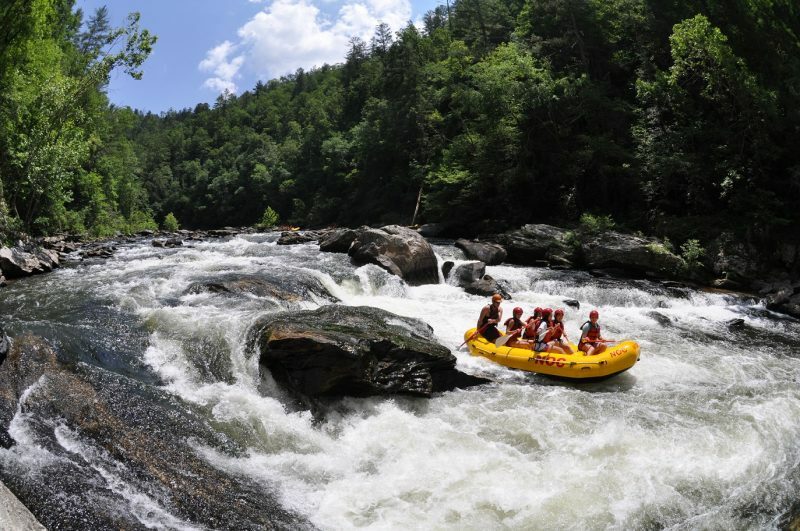 This top rafting destination in western North Carolina has been known to launch first-time rafters into a lifetime of rafting. Rafts can be guided or unguided along this narrow and crisp waterway through a quintessential Smokey Mountain forest. The trip ends (and the storytelling begins) just upstream of the Nantahala Outdoor Center at the Class III Nantahala Falls. River engineers revitalized the Oklahoma River from a muddy ditch running through Oklahoma City to a recreation hotspot and the state’s best rafting destination. Riversport Adventures whitewater park at the Boathouse District allows urbanites to experience the thrill of rafting anytime, while athletes can come to train and hone their skills. At the center, recirculated water with adjustable flows creates Class II-IV whitewater experiences that everyone from beginners to experts can enjoy. 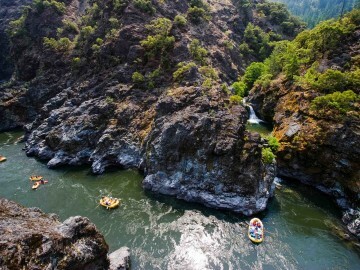 Among so many legendary rivers, picking Oregon’s top rafting destination is tricky. However, the Rogue River in the southwestern Siskiyou Mountains remains a true classic. 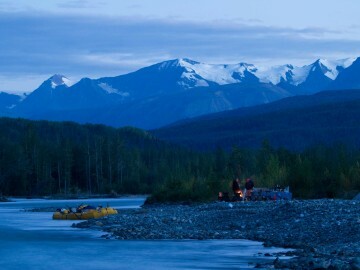 The 3- to 5-day adventure is one of the best all-around river trips in the country. Swimming spots, iconic rapids, rugged scenery, wildlife, historic homesteads and more make the Rogue a crowd-pleaser for river runners of every age and ability. In the Laurel Highlands of southwestern Pennsylvania, the Lower Yough tumbles over bedrock and boulders all year long. However, in the summer months, this rafting destination becomes a mecca for paddlers. Many opt to navigate their own raft, but at higher spring flows you’ll find a guide in each raft. Beginners to experts love this stretch of river nestled in Ohiopyle State Park and often find themselves floating it year after year. Also see: Delaware River (New Jersey). An aspiring Wild and Scenic River, the Nolichucky in eastern Tennessee transports rafters into a beautiful forested gorge with great whitewater action – 25 named rapids to be exact! The Nolichucky Gorge, the Southeast’s deepest gorge, houses most of the bigger whitewater action while the lower stretch of the river makes for great family floating fun. One river and the top rafting destination for two states, the Rio Grande in Texas also boasts a narrow gorge and incredible scenery for rafters, albeit different formations than in New Mexico. Tall limestone cliffs and the infamous Rock Slide Rapid make rafting through Santa Elena Canyon a committing adventure. Lower stretches of the river offer hot springs and gentle currents through the Big Bend area. 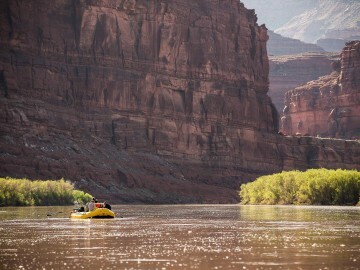 Legendary whitewater and peaceful sections of flat water through dramatic canyon scenery, combined with unprecedented access to Canyonlands National Park, epic hikes and camping on huge sandy beaches put a trip on the Colorado River through Cataract Canyon at the top of the list when it comes to the best Utah rafting experiences. Not to mention, in spring and early summer, Cataract Canyon’s infamous Big Drops can be some of the biggest rapids in North America. Vermont’s best whitewater rafting can only be experienced on a few special spring and fall days when water tumbles from an upstream dam to create eight miles of whitewater on the West River. Flowing into the heart of Jamaica State Park, granite boulders create exciting Class III-IV rapids while lush forest and scenic side streams dominate the scenery. Flowing through one of Virginia’s most popular outdoor destinations, the Shenandoah River allows rafting enthusiasts to experience the rolling, forested foothills of the Appalachian Mountains from the relaxing drift of a boat. While most visitors opt to stay in their vehicles on Skyline Drive, exploring the area by river allows a much more peaceful and true natural experience. Volcanic eruptions and massive glacial floods dramatically carved the Columbia River Gorge and the White Salmon River valley thousands of years ago. Today, the river’s basalt rock and continuous underground springs make it Washington’s top whitewater rafting destination. Blue water gushes from basalt aquifers and tumbles over Class III-V rapids for one of the best half-day rafting trips in the country. Hold on for Husum Falls, one of the tallest navigable waterfalls for rafts in the world. West Virginia wouldn’t be the same without the Gauley River. This premier rafting destination is where the East Coast’s rafting culture began. The weekend dam releases in the fall attract boaters from across the world to experience the Gauley’s big water, Class V rafting and kayaking in rapids like Pillow, Lost Paddle and Sweets Falls. The scene here can’t be replicated on any other river with boaters perched on rocks watching the action throughout the entire run. 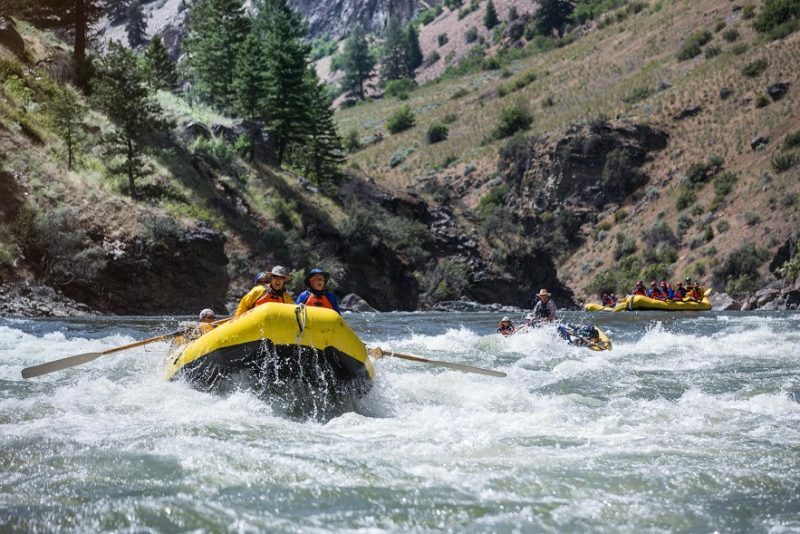 A great western waterway, the Snake River originates in Grand Teton and Yellowstone National Parks making it Wyoming’s top whitewater rafting trip. Imagine floating through these American landscapes where the idea of wilderness protection has long been treasured. Moose, elk, river otter, bears, and other local inhabitants frequent the shores at the base of snow-capped peaks. Choose a relaxing and scenic float through Grand Teton National Park or head downstream of Jackson to find big water rapids. Did we miss a state where you think there’s a stretch of river worthy of best rafting in the U.S. status? Chime in below. 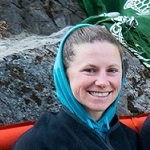 Susan has taught whitewater kayaking, guided rafts, researched river turbulence and sediment transport, paddled rivers in 7 countries, and written about her explorations along the way.